The Mayor of Encinitas sets the tone for the city, manages the City Council agenda and acts as the spokesperson for the city. It’s a position that requires experience, wisdom, empathy and strong leadership skills. But the Mayor still has only one vote of five, and must work very closely with the other City Council members on city business to be effective. I think I offer the right combination of what Encinitas residents want in their Mayor — environmentally focused, prudent with city finances and a consensus-builder about the issues that matter to Encinitas voters. In short, a level-headed, professional, pragmatic leader who listens. Right now, we’re nine months out from the November 2016 election and there aren’t any other declared mayoral candidates. Our current Mayor is running for County Supervisor, so the mayoral office will likely be open. There are always many candidates in Encinitas elections, so I do expect competition to emerge. But for now, it’s nice to know I can freely advocate for our city’s progress and prosperity without having to position myself against another candidate’s platform. I hope you’ll support me in my quest to further the progress we’ve made together over the past few years! 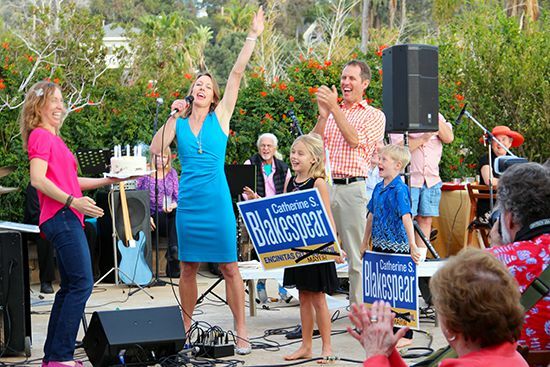 If you’d like to get involved, please email me at catherine@blakespear4encinitas.com with your interests, donate at the bottom of this email, or sign up below to receive these newsletters about Encinitas. In Encinitas City Council news, we certainly had a full plate this week. We approved a budget increase to install a quiet zone at Chesterfield Drive when the railroad is double-tracked through the San Elijo Lagoon and the Chesterfield intersection is redesigned over the next two years. A quiet zone means that the trains don’t blow their horns at all. Two speakers expressed pointed criticism about the city’s approach to informing residents about the multitude of rail corridor projects. I agree with the speakers that the city is not doing a good job communicating with the public. Fundamentally, the city bureaucracy has not taken ownership of the various projects in the rail corridor that will affect many people. Residents feel like they get the run-around by hearing different things from different agencies, with no single entity appearing to be in charge. This is our city and we need to be the clearinghouse for information. Additionally, we have not been providing information in a coherent way. Our website is organized under the agency that’s in charge of each aspect. I don’t think residents care which acronym is in charge of which segment; they want to know what’s going to happen, when, how it will affect them and when they’ll have a chance to offer input. They also want to see pictures, particularly of the fence and rail trail in the context of our actual Encinitas rail corridor, not just a rail trail floating in space. The city just hired two communications firms, and it’s clear they need to get to work on this immediately, before more valuable time passes. I have every confidence in our City Manager and her power to improve this inadequate situation. In some ways, a public airing of complaints can be an important catalyst for change, more powerful than behind-the-scenes grumbling. It adds urgency, and that’s what happened this week. Blessedly, some city improvements don’t generate controversy. The re-establishment of coastal sand dunes along Restaurant Row in Cardiff seems to be one of those projects, at least so far. When my mom was a child in Cardiff, before the creation of the San Elijo campgrounds, she remembers playing on Cardiff sand dunes. Similarly, my kids love to play on the sand dunes in Coronado, with its thriving beach ecosystem of plants, bugs and birds. The re-introduction of sand dunes will help protect Highway 101 from the effects of sea-level rise. We are applying to the state for a $2.2 million grant for the re-establishment of sand dunes. Nine months from now, the city will present voters with a ballot question that would provide the zoning for at least 1,300 more units of housing in our city. The reason for this is that state law requires every city to zone to accommodate new housing in future years. The state believes that there will be population growth and every city is responsible for taking in some of those new people. The State of California doesn’t allow a city to close its doors and say, “we’re full here, the inn is closed, please go to a different city.” Because of entrenched opposition to more density in our city, we’ve spent millions of dollars and thousands of hours struggling with our housing element update. Now, after many years, the City of Encinitas is one of only a handful of cities left in the state that doesn’t have a blueprint that allows for more high-density or lower income housing. The state, through its Department of Housing and Community Development, is heavily involved with us now. Being out of compliance with state law, among other things, led us to be sued by the Building Industry Association last year. We settled that lawsuit and agreed to put a measure on the ballot that would get us into compliance. We recently were sued again by another local developer, David Meyer, alleging similar things, as well as other development related allegations. From my perspective, we have to get into compliance with the law. We need to put the best alternative on the ballot this November, and trust that residents will agree it’s important that we stop wasting money on lawsuits we can’t win. We have no legal or rational basis to not comply with state laws that all other cities abide by. The current struggle is to find the best place for the up-zoned 1300 units. Where will they go? After months of community outreach, the City Council sent three potential maps forward for environmental review, which has now resulted in a fourth map that city staff calls the “environmentally superior alternative.” This fourth map removed the most serious environmentally offending sites — it’s a map that lessens the environmental impacts more than any other map. It includes sites inland to create walkable places and to distribute the rezoning fairly among communities. It also places much of the coastal rezoning in existing higher density areas along Hwy 101 and near important things like shops, beaches, parks, schools and restaurants. This fourth map recognizes that one of the biggest environmental effects of more housing density is traffic, and it avoids up-zoning of places that put traffic onto already maxed-out Encinitas Boulevard. We have not received any official briefings on the implications of this fourth map, and yet this week we were asked to decide what type of community outreach we wanted to do between now and the election. After expressions of frustration and a recognition of our lack of a clear, council-consensus goal, we voted to hire a professional services consultant with expertise in this area who would help us craft a ballot measure, do polling to figure out baseline awareness and help us learn what motivates opposition or support. The consultant will hopefully provide us with a proposed strategy, plan and timeline from now until November. Our city staff has been working diligently on this for a very long time, and I commend their effort, but we now need a more specific level of expertise. We also directed the city attorney to provide us with a memo detailing explicitly what will happen to the city if the ballot measure fails. We appointed three moms with school age kids to three commissions – Arts, Traffic & Public Safety, and Environment. This wasn’t intentional, but it’s great to get more young parents on city commissions, as this is an under-represented segment of our engaged populace in my opinion. Regarding electrical power, we created a subcommittee with Deputy Mayor Lisa Shaffer and Council Member Mark Muir to reach out to other cities about cost-sharing an analysis of whether to join forces to run a CCA (Community Choice Aggregation). CCAs provide cleaner power than what is provided by traditional utility companies. Lastly, I volunteered and was chosen to be the council’s liaison to our lobbyist in Sacramento so that Encinitas can have a stronger voice in advocating for issues that we care about at the state level. Having elected officials speak at hearings in Sacramento can influences the outcome and we’d like to have a more active presence. It’s an exciting time in Encinitas, with many big projects. I’m honored to be representing you and excited to be running for Mayor!